Pittsburgh, a city famous for its football team Pittsburgh Steelers, is an old, industrial town now a flourishing business and academic centre; a beautiful city with the rivers flowing in the midst and sorrounded by picturesque hills of the Allegheny mountains and valleys. The city also boasts of a rich cultural life that has been enriched by immigrants from around the world including the Indian sub-continent. Mr. Vijay K. Kapoor moved to this city about 32 years ago and brought with him the wealth of music that he had accumulated with patience and perseverence during his years in India. It was a monumental task, the fragile discs were brought batch by batch in their origlnal jackets. He was born in the then princely state of Hyderabad in 1937. He got his early taste of music from his family who listened to the immortal K. L. Saigal, matchless Kanan Devi and the famous singer, composer and actor, Punkaj Mullik, who also had the rare distinction of being a great music teacher. Gifted with a good voice Mr. Vijay Kapoor learnt singing by listening to these greats, a habit which he has kept to this day. At the tender age of 16, he happened to visit Calcutta and presented himself at Punkaj Mullik’s door step. The maestro was impressed by his singular devotion to music and his sincererity. Thus began a life long association with Punkaj Mullik and the ardous task of collecting music. His main field of interest is music from Bengal (both Hindi and Bengali songs), particularly music by composers of New Theatres. 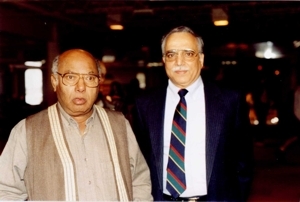 Below he is shown with Ali Akabar Khan, Habib Wali Mohd. and Dwijen Mukherjee. During his travels, he met many film personalities, director Nitin Bose, music director Kamal Das-Gupta, the famous blind singer K. C. Dey and Juthika Roy, to name a few. While in Bombay, he got in touch with Hemant Kumar and it developed into a great friendship. Hemant Kumar's doors were always open for him. 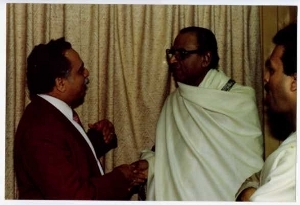 It was during this period he also met Manna Dey and Kidar Sharma (who wrote many lyrics for K. L. Saigal). He also had the rare opportunity of meeting K. L. Saigal's widow and his daughter who presented him with a fine portrait of K. L. Saigal from their family album. Though a Punjabi by birth, his association with Bengalis and love for their music encouraged him learn the Bengali language. So much so that the Bengali Association of Pittsburgh has elected him as Treasurer, Secretary and President, a very rare feat for a non-Bengali. 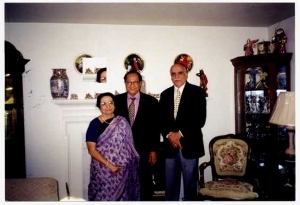 Ms. Feroza Begum visited him in the early nineties and stayed as his guest and collected every song composed by her late husband Kamal Das-Gupta from Vijay Kapoor. I had to travel 15,000 miles for these songs, she commented. Mr. Habib Wali Mohd. was his guest on three different occasions and collected almost all of his songs which he himself did not have any more. The other distinguished personalities who visited him or stayed as his guests include Mr. Bhimsen Joshi, Mr. Dwijen Mukherjee, Ms. Krishna Chatterjee, Ms. Kunika Banerjee, Ms. Pratima Banerjee and Suchitra Mitra. Life has its ups and downs. Some years ago, Vijay Kapoor had a stroke (CVA), lost consciousness and memory. On his familiy’s insistence audio tapes of K. L. Saigal and Punkaj Mullik were played round the clock at his bed side. He eventually made a complete recovery, which his physician partly attributed to the healing power of music. There are many collectors who like the security guards of Fort Knox are never able to enjoy the wealth they guard. On the contrary, Mr Vijay Kapoor daily sits down with a can of beer in the company of his supportive wife and enjoys listening to his vast collection, a life which Omar Khayyam had envisioned, here with a glass of wine thou beside me singing. 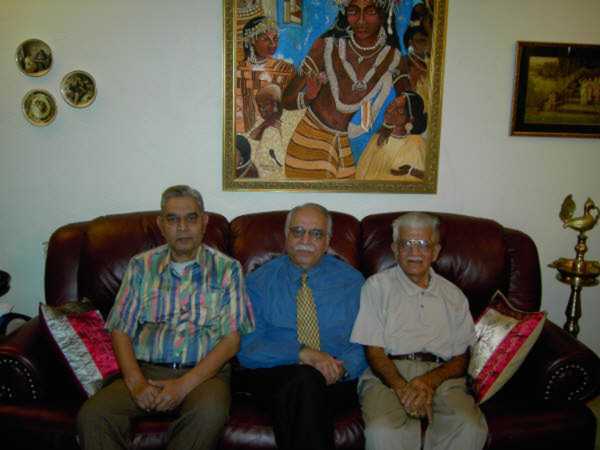 The authors (seen here, Kamalakar Pasupuleti on the left side and Dr. M. L. Kapoor on the right side of the picture, with Vijay Kapoor in the middle) during their stay as guests for three days found a vast amount of material in Hindi, Bengali and other languages. Some of the material is listed below:. 2 Entire songs of Punkaj Mullik – Hindi, Bengali and Sanskrit - including live concerts. 3. Entire songs of Hemant Kumar – Hindi and Bengali. 4. Most of the 78 discs of New Theatres movies both Hindi and Bengali. 5. Entire bhajans, geets, naats etc. of Juthika Roy. 6. Entire ghazals and geets of Habib Wali Mohd. 7. Entire songs of Ms Feroza Begum in Hindi and Bengali. 8. New Theatres orchestra discs of R. C. Boral, Punkaj Mullik and Timir Baran. 9. Countless other discs, LP’s, EP’s of other artists like Kanan Devi, Kamala Jhariya, Sandhya Mukherjee and Indrani Sen.
10.Complete songs of S. D. Burman in Hindi and Bengali. The authors consider Vijay Kapoor a collector par excellence and wish him a long, healthy and happy life. Important Note: Mr. Vijay Kapoor is not keeping good health and does not wish to be contacted. He does not have an email address. Kamalakar Pasupuleti, A great lover and collector of vintage music of pre – independence era. 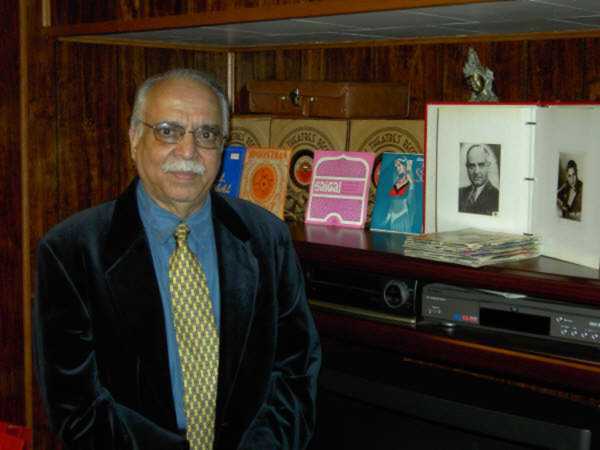 Dr Manohar Lal Kapur, a retired physician based in USA since 1967, is a great fan of Naushad and enjoys the music of bygone era.